Cedar Key - Day # 34 - "The Rain, The Park, and Other Things"
I'm a sucker for interesting song titles....The Rain, The Park, and Other Things was a 1967 song by the Cowsills, and the title, not the lyrics, perfectly describes Wednesday, but not necessarily in that order. We knew from weather forecasts that a front bearing rain and wind was coming sometime Wednesday, so we got together with Forest and Cindy (Finally Newellin) to visit some of the local springs. Florida is rife with natural springs. There are several here on the west coast of Florida near our location, and some of them are visited by Manatees when the coastal waters, or rivers get too cold. Typically these springs are around 72 degrees. We hoped we might see some Manatees, but since it is not that cold right now the odds are they would not be retreating to the springs for warmth. We left around 10:30 heading for Manatee Springs State Park, just outside of Chiefland. Even several miles inland the wind from the onrushing storm was pretty stiff, and as suspected there were no Manatees present. This is a very nice park, and was mostly empty as it is too early in the season. The water is amazingly clear. 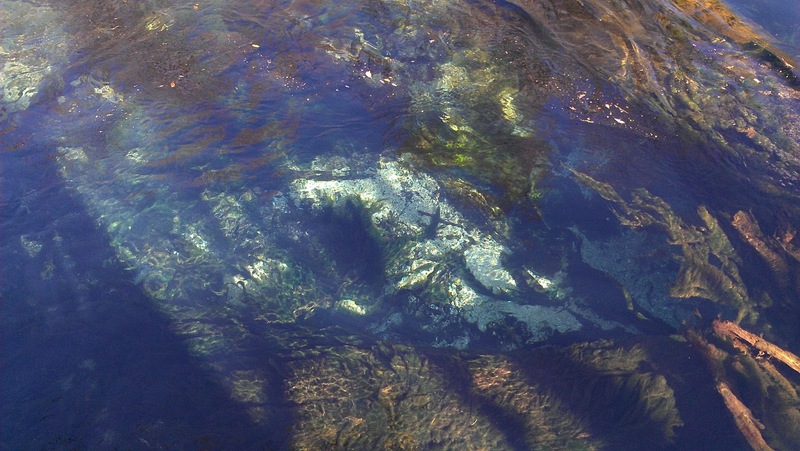 Manatee Springs is a Class 1 springs, meaning that it puts out 80 million gallons of water per day. It is on the lower end of class 1 springs, some which put out 200 million gallons a day! There is a very long boardwalk that follows the path of the spring water as it flows to the Suwannee River.....some of the boardwalk can be seen in the background below. There are canoe/kayak launches (not available during this season to protect the Manatees when they are present), a swimming area, rental cabins, and full hookup RV sites. I actually thought Fanning Springs State Park was a prettier setting, and its closeness to town, and strong cell signal were pluses if you were to camp here. Fanning is a Class 2 springs meaning it puts out around 40 million gallons of water a day. They also have nice rental cabins, boat launches, a swimming area, and a nice RV section. No Manatees were sited at this park either. From Fanning Springs State Park it was a short hop to Otter Springs County Park. Each of the State Parks charged a $6 per vehicle entry fee, but the County Park charged nothing for us to drive around. 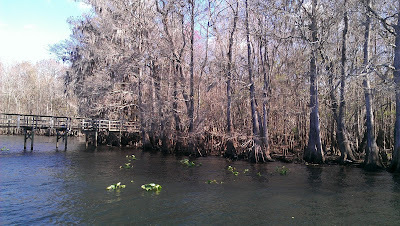 After a picking up some groceries from the Winn Dixie and fueling up Forest's Chevy Z-71 we headed back to Sunset Isle. 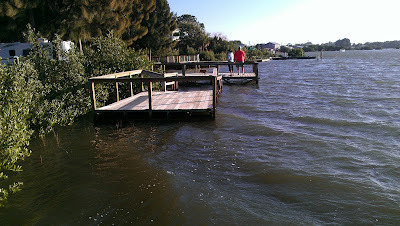 The westerly winds had been pushing water from the Gulf into the back bay all day, and when we returned the water was up to the bottom of the docks....the highest by a few feet we had seen since we arrived a month ago. Our NuRVers group had a Tex Mex Buffet schedule for 5:15, and there was some concern about the wind, but we found that right next to Chris and Cherie's GM bus it was pretty sheltered, so we gathered there for some great food, which included a Gumbo offering by Forest and Cindy (Yummy! ), a Puerto Rican dish (Cherie and Chris), Black Bean Chili from TLE, Tex Mex Potatoes by Forrest and Mary Clark, some Veegan Nachos and salsa by Bill and Debby Kasson.....no doubt I have inadvertently left someone's contribution out, and I apologize in advance. 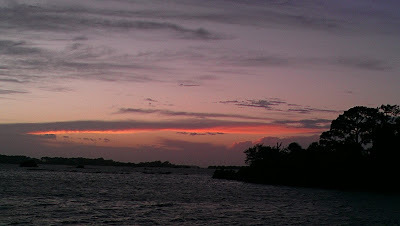 We had our typical great time together eating, and watching another Cedar Key sunset......#34 for us. The wind continued all night long, sometimes very gusty (it is still blowing as I write this morning around 9 am), and eventually the rain came, while it was intense for a time, it did not last a long. We've only 4 days left in Cedar Key, but we approach our departure date knowing we have done everything here we wanted to do, and are now looking forward to our trip down the coast to Key West! One year ago today, Wednesday, January 3oth, 2012 we began our multi year odyssey around the USA. We've been back and forth across our country 3 times in that time span.......any we have only just begun to explore! Okay, now what can I write about Tuesday? It was cold, damp and overcast to start out, but like most days here in paradise the sun came out.....and so did the humidity......there is a front coming in Wednesday, and no doubt it is pushing the humid air before it. Mind you, no the mind numbing humidity, but humidity nevertheless.....it is 93% as I write. I spent a little more time working on Pat's mountain bike.......replacing a couple of rusty bolts on the stem, and then got to work on Bill Kasson's bike.......he had brought his bike over Monday while I was deep in the weeds on Pat's, saying the brakes needed adjustment. I put his bike up on the rack and could see immediately what the problem was.....he has a basket on the front that the brake cables are "threaded" around and through. It was the way they were routed that was increasing the friction of the cables in their housing making them stick, and not function smoothly, so I detached the cables from the brakes and re-routed both of them resulting in a better braking experience. 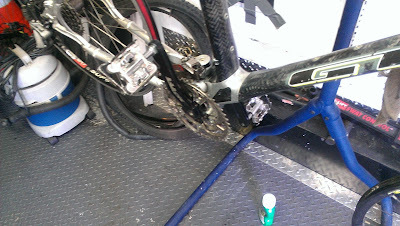 After delivering Bill's bike back to him I returned to the coach, turned on the AC and took a shower......very humid out in the trailer, even with the fan running. Around 1 pm I walked over to Chris' coach for a presentation he and Cherie were going to do about their Lithium Iron Phosphate batter bank. When all interested parties were assembled I think we numbered around 9, or 10. Chris and Cherie are way out there on the "bleeding edge" of this technology, and I have been following their experiment with great interest. Chris has written an article entitled "A Year on Lithium".....click on the link to read this extremely thorough report and analysis. This is probably the 3rd time I have heard their presentation, but I learn something new every time.....plus, it doesn't hurt that they are very interesting people talking about a very interesting subject. Well, one thing led to another.......we ended up ordering in pizza from Island Pizza to the Tiki Bar and talking until well after 8 pm. Our Sunset Isle neighbors (Site C) Jack and Elizabeth joined our gang around 5:30 to watch the sunset, and we pretty much spent the rest of the early evening talking with them, Forest and Cindy (Finally Newellin'). We were introduced to two friends of Chris and Cherie.......Lesson and Josie.....you can see Lesson in the picture above just to Chris' "stage left".....Josie is being obscured by the bar tender. Of course, you have probably guessed by now that Lesson's parents are/were hippy's, hence the unusual name......BUT, it fits.....he is a very interesting guy. I listened to Josie talking and began to realize there was a very interesting accent at work there......finally I said to her "I just have to ask what is the origin of that fascinating accent?" she replied that she grew in Puerto Rico, and then spent a lot of time in the south......so her Puerto Rican accent is flavored with a southern drawl......now that is a new one for me.....very captivating. The pizza arrived around 7:30 (Forest and Cindy split an 18" pizza with TLE and I......half the pizza had anchovies, which Forest, TLE and I enjoyed....there were liberal amounts of black olives, mushrooms and onions on the entire pizza). As we ate we continued our talk with Jack, Elizabeth, Forest and Cindy. Jack and Elizabeth are from Vermont, and spend 5-7 months on the road each year in their 5th wheel. Like so many people we have met on our journey they are great people with a great story. 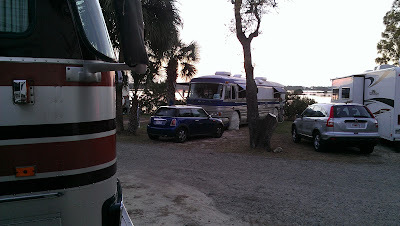 Looking forward to getting better acquainted in our remaining days here in Cedar Key......which are now down to 5.....:( Around 8:30 the noseeums starting getting at my ankles, so we ambled back to our home. We watched an episode of NCIS Los Angeles on live cable TV, and then called it a night. I am really beginning to love when a day doesn't go as planned.....you just never know what delightful things will happen if you are willing to deviate from your course a little. 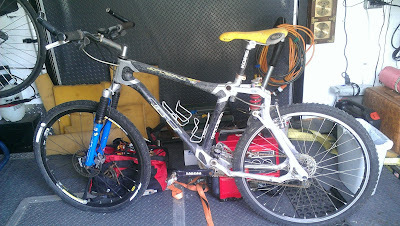 Sunday evening I picked up the GT STS-1 Full Suspension bike belonging to Pat Bonish. While we were at the Tiki Bar Pat and I did a quick overview of his bike to see what needed to be done. From the time I got Pat's message Sunday afternoon I was eager to see the bike, and to start working on it. I woke up around 2:30 am Monday morning thinking about the process of disassembling the bike, and what problems I might run into. I haven't taken a bike apart for over a year, let along reassembled it. 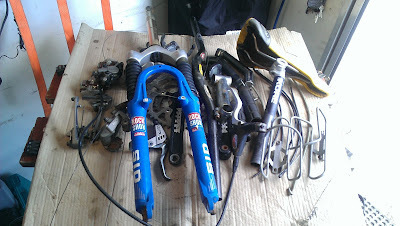 Usually when I take a bike apart it is to part it out on Ebay. 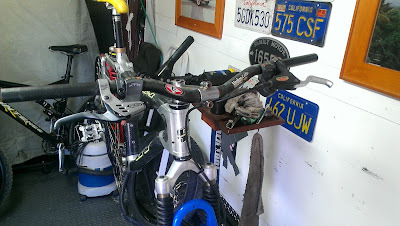 If you have been following my blog for a while you will remember that when we were stationary back in Riverside, CA I bought a number of bikes on Craigslist for good prices, took them apart and sold each component separately on Ebay usually doubling my money, and sometimes tripling it. Pat's bike is the kind of bike I would look for. 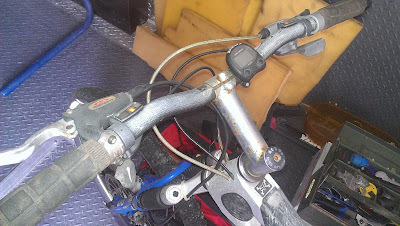 It had been sitting for a few years, and in this seaside climate, even if the bike is kept in doors, eventually the salty air works its magic and corrosion begins to appear, shifter and brake cables seize up, and eventually the bike becomes non-operable. Usually the owners are overwhelmed by what needs to be done to bring the bike back, and just decide to sell it and move on. Thankfully Pat decided to let me bring her back to life. 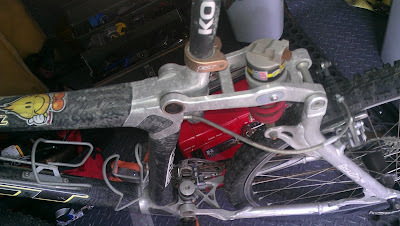 I finally dropped back off to sleep, but was up before 7 am to do my daily blog, so I could get over to the trailer and immerse myself in this new project......take a bike apart and then put it back together. Over the years I have built 5, or 6 bikes from scratch, starting with just a frame, and buying the components I wanted and creating the bike I wanted, so putting a bike back together is pretty much the same thing. 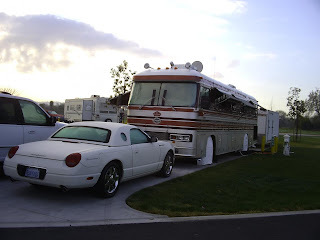 I arrived at the trailer around 10 am full of anticipation. I moved the tandem outside for the day, got out my generator and powered up the trailer, then put the GT on the bike stand to begin surgery. The disassembly went quickly.....there were a few bolts that need a little persuasion with penetrating oil, but everything came apart pretty easily. Below you see the pile of components ready to be cleaned of a few years of grime, and rust. And here you see the frame reduced to its basic essence. This is really a beautiful composite frame, combining aluminum and carbon fiber pieces, which makes this frame is very, very light. I left the coach without eating breakfast, so eventually TLE arrived with a breakfast sandwich for me, and a fan to help ward of the muggy feeling of the air. The hours just kind of melted away as I descended "deep into the weeds" cleaning each of the high end components for this bike, which in its day (around 2003-4) was state of the art, and frankly the parts Pat has assembled on this bike are still worth a lot of money. If these components were the typical entry level stuff you find on bikes off the rack they would have been toast by now, but the components used on this bike cost a lot because they are made to last, and function even under the most extreme conditions. During the process I received a number of instant messages from Pat on my phone about the things he was ordering from Amazon that needed replacing (chain, shifter/brake cables, grips, tires, etc. 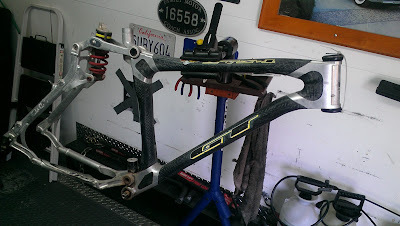 ), and to each I replied "Yes"....so the order is in and we should have what we need to finish the bike in a few days. In the mean time I reassembled the bike as far as I could go. She is looking much happier now after a lot of "elbow grease", real grease, oil, and polishing. Way back in Vancouver, WA I found these Wellgo platform/SPD pedals, that have an SPD clip on one side, and a regular platform on the other at the local Goodwill for $1.89. I didn't need them myself, but figured someone would down the road. Pat was looking for the option of just riding the bike in flip flops if he wished, or with MTB shoes that clip on to the pedals. I'm glad these pedals have found a new home. I had gone as far as I could go in the reassembly process around 4:30 pm.....it didn't seem like five and a half hours.....it didn't seem like work.....it was just another Cedar Key day spent doing something that makes me smile. Having those 50's tunes playing in the background all day wasn't unpleasant either. I took a shower, and sat down in my recliner thinking about what a great day I had spent, while eating some salsa and chips (TLE's salsa mind you), and sipping one of the Anchor Steam Porter beers Krash had left with me the other day. Before I knew it TLE was waking me up, and telling me I had just missed the sunset. She had just come back from taking this picture.....# 32....I love how the sky reflects off the glassy water.....just breathtaking. 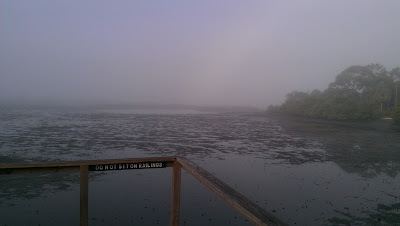 Sunday started out a little foggy (see picture in Saturday's blog entry). TLE and I were thinking about going into Pat's for breakfast....I really wanted to try another of their omelettes. I messaged Debby (Bill and Debby's Wild Ride) asking if they were up to riding bikes into town to Pat's and got a pretty quick reply "sure". We met out front by Bill and Debby's site around 10:30 and began our ride into town bundled against the cold damp air. Debby set a pretty brisk pace while we all chatted. Arriving at Pat's it was still a little cold and damp, but we decided to brave the elements and sit outside. We were rewarded within a few minutes with clearing skies. We continued talking about travel experiences, favorite places, places we had both visited at different times. Eventually it was time to mount our two wheel steeds and begin meandering around the back roads of Cedar Key. We passed by a yard sale and stopped to see what they had....nothing caught my eye, but Debby spied a purple haired Barbie doll disembodied head that she could not leave without.....the price.....25 cents. I had no idea what she intended to do with just a doll head, but the mystery was quickly resolved. What is Debby pointing to at the top of her bike flag pole? From the yard sale we rode over to the long boardwalk next to the local cemetery that takes you out over the wetlands and along the water for quite a distance, and bikes are allowed! From there Debby took us to another cool boardwalk that is way off the beaten path, and apparently, if you don't know about it you would never know it was there. It's not even a place you might stumble across....it is just not obvious as you roll by. Now this boardwalk was only meant for walking on, and in one spot it was a little sketchy, but we all made it out to the end and back without mishap, although Debby came close to sliding off the sketchy part on the walk back to dry land. All told we rode just under 8 miles, and had a fun time see some more things we hadn't seen before. I think we arrived back around 1 pm, but don't quote me on that. I did not look at my watch, so it could easily have been earlier, or later. 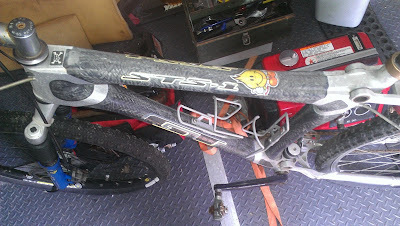 Upon our return I found a message from Pat Bonish wondering if I would consider bringing back to life his GT STS-l full suspension carbon fiber frame mountain bike. In a prior life he was an avid mountain biker (similar to moi), and rode several times a week, but since he has landed here in Cedar Key has not had the time to ride (there is a certain lack of mountain terrain to explore here in Cedar Key), so the bike has been sitting for a long time. His bike has "good bones" and I'm looking forward to getting her back into riding condition. The question is "can I get it done in 8 days? ".....well, you'll just have to follow along to find out. We walked over to the Tiki Bar around 5ish to watch our 31st sunset, and it did not disappoint. Well, now we are the short timers......this time next Monday we will be rolling our wheels south from Cedar Key with the memories of wonderful times spent with amazing people tugging at our heart strings. The wanderlust of the road calls, and it is almost time to change our view again on a regular basis. The almost 5 weeks we will have spent in Cedar Key has been full of serendipity, and has seen the deepening of existing friendships, and the beginning of others. One of the things you would know about me from reading this blog is my love for bicycles. I carry in my enclosed trailer a tandem, two road bikes, and a mountain bike. Before our Spokane interlude I also had two tadpole recumbents along for the ride. 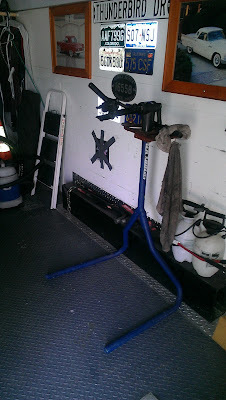 I carry a bike stand which enables me to get the bike on which I am working off the ground. 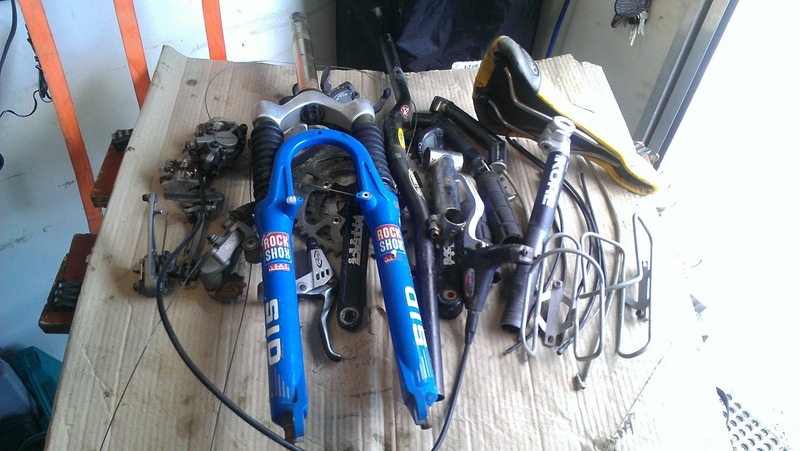 I carry a full set of bike specific tools, as well as replacement parts, etc. Since our arrival here at Sunset Isle RV Park and Motel I have made offers to the members of the NuRvers group to tune up their bikes if that was all that was needed, or address specific mechanical issues they may be having. At first I didn't have anyone bringing their bike over, but eventually Debby Kasson (Bill and Debby's Wild Ride) asked if I would look at her beach cruiser for a specific problem (bent rear derailleur hanger), so I had the pleasure of "digging" into her bike for a few hours, and getting it working, and running the way it was meant to. Eventually the word got out and I worked on Brian's (The Roaming Pint) bike which had major problems.....only one of seven speeds worked, the rear brakes were frozen up, and the front ones were getting there. It took a few hours of pleasant work to get it running again, but now it works pretty well. 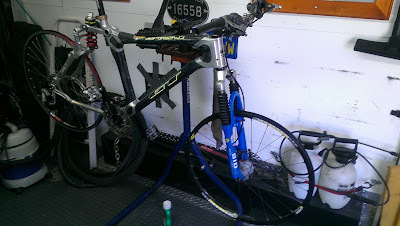 When I took his bike back I picked up Maria's which really only needed a tune up. Pretty soon I got a message on Facebook from Forrest Clark (NuRvers) asking if I would take a look at his bike, even though it was pretty new. It just needed a minor tune up and lube. Around the same time I got a message from Jay (Slider Magazine), who was currently in St. Augustine, FL, but wanted to know if he could bring his Specialized bike by when he returned to fix an ongoing issue with his rear hub. He brought his bike by Saturday morning. It took pretty much every tool in my tool box to fix the problem with his rear hub, but fix it I did, and what a blast I had taking that bike apart, and putting it back together. He dropped by later in the day after I had returned his bike (he wasn't "home" at the time) asking where his dirty bike was.......he didn't want the "new" one I had left by his motorhome......you see, now that makes me smile. I told him I have a genetic predisposition toward cleaning, and that I couldn't help it, so he would just have to get used to the "new" bike I brought back. Friday night I had gotten an e-mail from Karen (of Krash and Karen fame) asking if they could take me up on my offer to tune up their bikes, or at least check them over, so they came by around 1 pm Saturday with their bikes. All four of us stood out in the trailer while I worked first on Krash's Schwinn hybrid fixing a rear brake issue.....they were continuously rubbing. Next up was Karen's Diamondback hybrid, which needed some adjustment to the rear derailleur as it was not shifting through all 7 gears properly. All that "fun" took about an hour and a half.....and, seriously, it was fun. Thank you to all those who have taken me up on my offer to use my "wrenching" skills on your bicycles.....and to those of you who have not seen fit to contribute to my addiction.....and you know who you are......have a little pity on a wrench addict and bring your bike over for me to play with for a while......pretty please? Krash left me with 3 bottles of Anchor Steam Porter for my efforts. Please understand, I do not do this for gain, but will not turn down offers of good brews if they come my way. I wasn't that impressed with the appetizers, but enjoyed my Blue Moon draft beer.....I will say I though their Onion Rings were slightly above average. The sunset did not disappoint, and the conversation flowed without pause. Yelp reviewers give it a 3 on a scale of 1-5....I would give it a 2.5. It has been four weeks to the day since we departed Campbellsville, KY and Amazon.com, and it is time to evaluate our experience, and answer the question most often asked....."Would we do it again?" Elaine and I are in pretty good physical condition for our 63+ years, and we made a sincere effort over the months before we began to work at Amazon.com to stay fit through bike riding, and hiking. In the 2 months leading up to our October 8th start date we did a LOT of walking.....often up to 5 miles a day. We tried on 100's of pairs of shoes trying to find the best pair, or pairs for our 11 week stay. Ultimately, the shoes we wore the most at Amazon were ones we bought AFTER we had been working there for a few weeks. We found out that the only way to prepare for standing and walking on cold concrete for 10-12 hours per night was to actually do it. It's not the distances walked each night (10-12 miles) that was the problem, it was being on our feet for that many hours in succession. The shoes we purchased prior to our arrival were all good shoes....they just were the wrong size. "Wrong size?" you ask....don't we know what size shoes we wear? Yes, yes of course we do, but we did not count on our feet increasing in size by one whole shoe size during our 11 weeks. Shoes that worked the first two, or three weeks, were too small ultimately. For me the two pairs of Keen hiking shoes I own were the best shoes for me, and I alternated between the two pair for the last 8 weeks. After a few weeks I found that the cargo shorts with underwear were just uncomfortable at end of the shift. I had a pair of ExOfficio convertible pants with netting requiring no underwear to be worn. If you are wondering why just imagine yourself living in a humid, warm climate.....would you rather wear board shorts, or shorts with underwear all the time? Ultimately I zipped off the lower part of the pants, turning them into shorts, and wore them every night (TLE had to wash them every couple of days), with a t-shirt. Some nights when it really warm I would wear a tank top. TLE wore shorts and t-shirts too, but she chose to wear underwear. We usually wore heavy jackets, gloves and watch caps to work, and were usually colder walking to work than going home. We were so hot from 10-12 hours of walking that the cold air, sometimes in the low 20's, was quite refreshing. The hardest thing to prepare for, which I did not anticipate...... and I am not speaking for TLE here.....was the incredible, mind numbing boredom I fought through every single night, until the last couple of weeks. Boredom makes the time go by so slowly. The only way I could get through the night was to be short sighted. By that I mean I broke the "work day" into parts.....the first part was the 5:30 pm to 8 pm stretch before our first 15 minute break. The next was the two hour stretch from 8:15 to 10:15 when we had our 30 minute "lunch". The hardest stretch of the night was the 3 hour one right after "lunch" from 10:45 pm to 1:45 am. The last 2 hour stretch on our 10 hour shift from 2 am to 4 am went pretty fast usually. When we went to our 12 hour shift (11.5 hours of work with a 30 minute lunch) we had one more 10 minute break at 4 am, which made the last stretch 1 hour and 20 minutes.....but really I would drop my last tote off at 5:20 am, and reach the last time clock at exactly 5:28 am to punch out...it was legal to clock out from 5:28 am to 5:35 am....any earlier, or later and you were in trouble.....we never had an issue with that. So the last 1.5 hours was really only 1 hour and 10 minutes of actual work. Anyway, my point is by breaking the shift down into these time blocks, and only focusing on the next break, helped me stay sane. I really tried not think too often about how many hours left in a shift, or how many days were left on our contract, because it just seemed too overwhelming. The friendships we formed during our stay, which I have written extensively about in the blog, were a blessing, and helped us cope. Without Jim, Jacque, Mike, Lizzie, Jim, Sharon, Richard and Pat our experience would have been much more difficult. In addition to our workamper friends we made friends with several full time employees (Kim, Sharon, another Kim, and Jan). We were treated well by those we worked under, and never felt oppressed, or taken advantage of. Safety was taught, and encouraged at every turn. We were led in stretching exercises twice per shift, and encouraged to stop whenever necessary to do more stretching if it was needed. If we preferred to work in one part of the building more than another we were accommodated without hesitation. Being able to spend part of each week working in HRV (High Retail Value) was wonderful.....working up on the fourth floor of the PIC MOD "C" made time go fast, because we did more than just pick....we would pick for an hour, then pack for an hour, then help resupply the stations, dump trash cans, etc. Our duties were varied and that is what made the time fly up there. Amazon encourages you to cross train for other departments, even if you are a workamper. There are other departments like TRANSHIP that I would also try to get cross training in just for the change of pace, and the variety. Okay, now for the $64,000 question.....would we do it again? Right now I would say possibly, but we would only do it for the last 4 weeks of "Peak Season", and not for 10, or 11 weeks again.....that was just too long a commitment. And it would not be this year. Would we go to Campbellsville, KY again? Yes, if we did Amazon again we would prefer Campbellsville, KY to the other two options for workampers (Coffeyville, Kansas or Fernley, Nevada). We grossed around $10,000, and netted just over $8,000....$8,000 in our pockets was our goal, and we achieved it. We will be visiting 6 of the Camperforce friends we made over the next two weeks after we leave Cedar Key on our way down to Key West. The bottom line is we feel richer for the experience, and blessed for the new friends we made. There are other workamper opportunities we are investigating, and I will write more about them when we begin to zero in on one. Thrice in as many weeks while meandering around the streets of Cedar Key I have found a small treasure in a yard sale. Found these lightly used clipless mountain bike pedals at a yard sale behind Island Pizza......new these babies sold for close to $85.....got them for $10. Nice to have an extra set of pedals in case I run into someone down the line who needs them......sweet! (By the way G.A.S.S. stands for Gravity Activated Spring System). Friday is the day when the empty sites here in paradise begin to fill up with short timers, and now our 5 pull site section is full. The daily highs are beginning to creep back into the high 70's, and the skies continue to be mostly clear, but it still cools off fast as the sun nears the western horizon. We kind of puttered around until late morning when Forest and Cindy came by to see if we were going to walk into Kona Joe's for a late breakfast......sounds good to me! Within 30 minutes we were on our meandering way into town. At just about the half way mark, as we were passing "Island Pizza" we spied a yard sale underway. Not surprisingly, Krash and Karen were already there sifting through small treasures (Island Pizza is right across the street from their rental home). While everyone else chatted my eyes kept wandering from table to table in search of that one special thing I could not leave without......eventually they caught a glint of bright yellow.....I edged around the table to find the KORE G.A.S.S. pedals previously mentioned. Now, what am I going to get rid of so there is room for these pedals? No one else pulled the trigger on anything, although Forest came close, so we continued our amble toward Kona Joe's arriving there around 11. It's great to have Joe and Edie back from their cruise......it's been too long since my last cup of Kona Coffee! Eventually Karen and Krash appeared with their dog Pipa, and we all sat talking and laughing......all the while enjoying the great view of the back bay off the veranda of Kona Joe's. After a wonderful interlude Forest and Cindy continued their walk into downtown, while TLE and I headed back to Sunset Isle......of course there was a stopover at Sandy's Produce to pick up some fresh eggs, and other produce items......Sandy said she had a fresh shipment of fish coming in later which would include swordfish......haven't had a good swordfish steak in a long time.....I think we'll have to return a little later for sure. I spent some time putting a little polish on my yard sale acquisition for the week. Out of the blue I look up to see a 6'5" gentleman smiling at me and waving me over. Turns out his name is Joe, and he has been following our blog for a while. He and his wife live in Lake City and had driven into Cedar Key for dinner.....as they passed Sunset Isle he remembered we were probably staying there, so pulled in to say "Hi" and talk for a while.....cool.....a little more serendipity. Just a little later TLE returned from her short shopping excursion with the aforementioned swordfish steaks.......it was about this time Chris (Technomadia) walked over looking for an extra set of hands to help repair his punctured Sea Eagle....turns out he and Cherie got to close to an oyster bed, took a hit to the bottom puncturing the bottom air chamber.....fortunately they were not far from their dock, so there were no casualties. I was glad to help, because I'm sure at some point I will suffer the same fate. To be sure the process for patching the Sea Eagle is much more complex than fixing a flat bike tire, so I paid close attention. Looks like she is fixed, but we won't know for sure until Saturday when it's time to apply air pressure again. By this time the sun was getting precariously low in the horizon and it was time to head over to the Tiki Bar for some drinks, fellowship and our 29th sunset. We walked over with Forest and Cindy. I finally remembered to bring a California license plate from my small collection to add to Pat Bonish's massive collection lining the interior walls of the Tiki Bar. Forest and Pat are both avid photographers.....Pat is a professional, and immediately recognized the equipment Forest was carrying resulting in another one of those spontaneous conversations that happen so often here in Cedar Key. While they talked we walked into the Bar and got our beverages of choice and then headed over to the deck to be amazed again. Soon Chris and Cherie drifted in, and were joined in short order by Kyeli and Pace.....there was much ooohing and awwwing, of course. We watched for close to an hour as the sun set, followed by the long, long after glow that just lights up the sky. Soon it was time to head home and get the BBQ out so we could dig into those two large swordfish steaks. TLE made some great sides.....green beans with a balsamic glaze, and a nice chopped salad. Of course Mr. Coppola was there to chase the great food! This is so funny.....I sat down this morning to write about yesterday and was thinking...."not much really happened Friday....what am I going to write about? ".....well, I guess I answered that question......sometimes not much is really a lot. 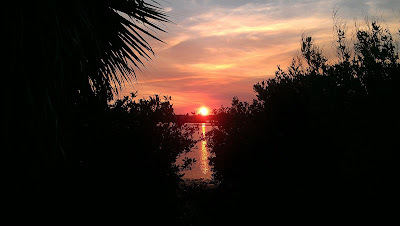 Some days it's difficult to come up with a catchy title that captures the mood, and character of a given day.....especially when there have been so many special days here in Cedar Key. One of the things we both cherish about our time here in Cedar Key are the numerous new relationships and friendships that are developing. Developing relationships and/or friendships involves getting to know one another, and that involves a lot of talking....sometimes standing in one place, sometimes walking. Thursday was a day for conversations. There is something almost mystical about Sunset Isle RV Park and Motel that brings people of varying backgrounds, geography, interests, philosophies, and values together in a way that is simple in its nature, but complex in its composition. I struggle for adequate words to convey what happens when you spend time here. Many say this is the friendliest RV Park they have ever visited....and these are people who travel thousands of miles a year all over this amazing country. There is this aura of mutual respect and acceptance that is rarefied, and precious. That may be why it is painful to think about leaving. Good examples of the foregoing: I walked over to Forrest Clark's class A motorhome to pick up his Gary Fisher mountain bike to tune it up......I stood there talking to Forrest and Mary for the better part of an hour, almost forgetting the reason for my visit. Then while I was tuning the bike Cindy and Danny, out walking their Jack Russells, stopped to talk.....and there went another 30 minutes of pleasant conversation. As I was delivering Forrest's bike to him, Forest and Cindy Olivier drove up and joined the conversation. During that time we decided to walk into town with Forest and Cindy for a latish lunch......more walkin and talkin. We talked all the way into Big Deck Raw Bar, and continued while we ate.....suddenly Karen and Krash appear on the sidewalk and we invite them to sit at our table......much, much more conversation. Before we left on our walk into town I struck up a conversation with a new couple, Jim and Charlotte, who moved into the site next to ours.....they were getting ready for a bike ride, and, of course we talked about bikes.....20 minutes of breaking the ice. Of course the walk home from Big Deck involved more conversation.....we stopped at Sandy's Produce to buy cheese.....Forest and Cindy needed some vegetables, and ran into Debby and Bill. That evening NuRVers was sponsoring an Asian Buffet.......much, much more fun, interesting conversation as we ate great food, and watched another magical sunset that kept evolving for the better part of an hour. Thank you Chris, Cherie, Kyeli, Pace, Forrest and Mary for your parts in making last night another special evening of conversation and memory making. As I have remarked often in this blog "at the end of the day" it is the people we have met along the way that will occupy our hearts, and memories for years to come.....sure the places are interesting, captivating, and amazing, but it is this place which provides the wonderful tableau for building these friendships. Wednesday was the designated pontoon boat tour of the local waters and islands (keys). Pat Bonish, who owns and operates Low Key Hideaway Resort (and Tiki Bar) with his wife Cindy, offered to be our captain and tour guide for the afternoon. Eight intrepid souls signed up for "a three hour tour".......I apologize.....I just had to sneak in a Gilligan's Isle reference.....pretty weak, huh? Actually it was to be, from the beginning, a 4-6 hour tour....the length depending on the 8 of us. As it turned out we spent around 6.5 hours on the water visiting Seahorse Key and its lighthouse, North Key, Atsena Otie Key as well as the back bay areas around Cedar Key. 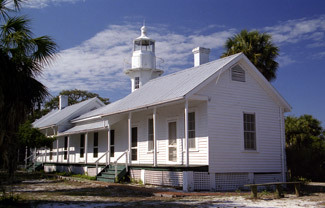 Atsena Otie Key was the original site of the town called Cedar Key, but after the devastating hurricane of 1896 the town was moved back one island (key) to its present site. As we were sitting out in the Gulf awaiting the sunset we were surprised by serendipity....a pod of dolphins frolicked nearby as the sun set on another magical Cedar Key day. They were so close you could hear them breath each time they breached the surface. To be sure, it was a chilly day on the water.....never got much above 61 degrees, but the breeze was light, the skies clear, and the water mostly flat all afternoon. We arrived back in the harbor just after dark with smiles on our collective faces. Over 6.5 hours we covered many nautical miles, and got a completely different perspective of the area surrounding Cedar Key with Captain Pat providing us with a wealth of information about the area. The cost per person broke down to $26.25......not bad for a great afternoon of site seeing. One might think this day was over, and could not get any better, but there is more.....our good Newell friends, Forest and Cindy, arrived in their 1993 Newell (39') while we were out on the water. They have just recently sold their sticks and bricks home, divested themselves of a lifetime accumulation of stuff, and hit the road full time for a few years. We first met them in Creede, CO at a Newell mini-rally, and then again in Santa Fe, NM. And we have parked on their former property in Thibodaux, LA. We made a quick change of clothes and walked over to greet them around 7 pm. After a glass of Pinot Grigio we headed into town for dinner around 8 pm and found the Blue Desert Cafe open! Cool....I thought they were closed on Wednesdays. We sat talking for a couple of hours, and enjoying another amazing meal....I had the grilled tuna steak special with zucchini and rice.....everything cooked to perfection! As I have mentioned before, the Blue Desert Cafe is only open for dinner each day, and opens at 5pm. This quirky, funky place is not open every day, so check ahead for their schedule. Okay, this day of serendipity is now officially deemed over. Thanks for stopping by! 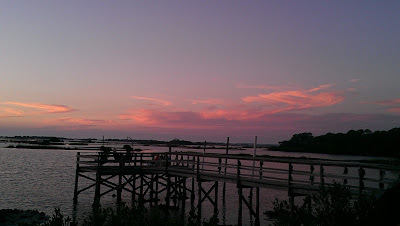 Cedar Key - Day # 23 - Can It Get Any Better? Cedar Key - Day # 21 - "Gone With The Wind"
Cedar Key - Day # 9 - What day is this? 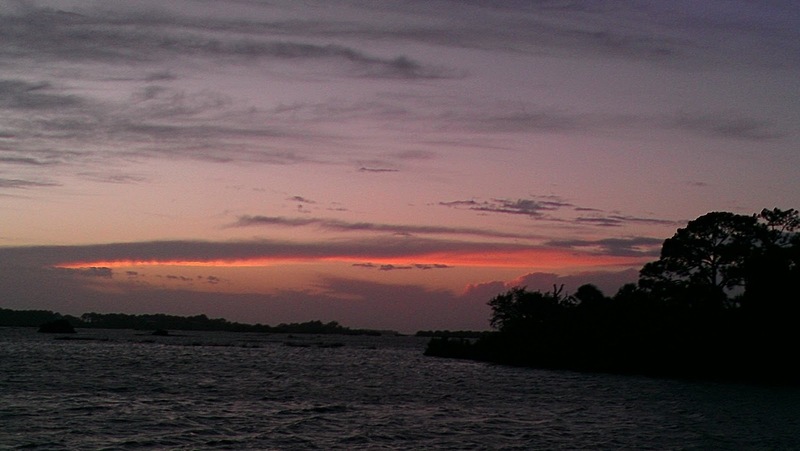 Cedar Key - Day # 6 - Let it rain! New Years Eve......and HAPPY NEW YEAR!! !